To prevent wind from billowing the jacket around the waist, we extended the back until it almost touched the seat of the bike. To give the jacket a snug, wind-tight fit around the torso, we shaped the jackets sides so they would curve over the riders thighs. Then, to keep the jacket from pushing up into the throat while riding, we shortened the front. To increase wind protection without adding bulk and still maintaining a good collar height, we lined the collar with long-lasting rayon. Then, to allow the collar to either be fully sealed or snapped open, without anything loose flapping in the wind, we extended the collar and added snaps. For further wind protection without bulk, we added a full-length, rayon-lined wind flap. Then, by extending the front zipper up to the neckline and capping it with the collar, we eliminated air leaks. We started the zipper a few inches up from the bottom, so the jacket would splay out slightly, increasing comfort for the rider. Next we looked at the reach, and the need to keep the body of the jacket snug, while allowing easy movement with different layers of clothing. So we redesigned the action back with three internal bands of elastic to hold its shape and pull it back into place. We added matching inside pleats to keep the lining floating in the jacket, so as not to impede movement or reach. To reach the bars more easily we biased the sleeves forward at the armholes and added underarm gussets. The wrists got particular attention - as most sleeve ends are fully lined the sleeve ends become bulky when the wrist zippers are closed. So we invented a way to sew the lining around the wrist gusset edges for the unlined wrist gusset to fold away when the wrist zippers are closed. From our many years of repair experience, we knew that anti-wear cuffs inside the sleeves would keep the lining from fraying at points of contact so we created all-leather sleeve ends turned up to prevent wear. Then we folded and shaped the leather into the turned up position so a lining repair or alteration would not leave any visible needle holes. Last but not least, we built the jacket with wide, substantial inside leather facings for anchoring the inside pocket and keeping the lining away from predictable wear points. 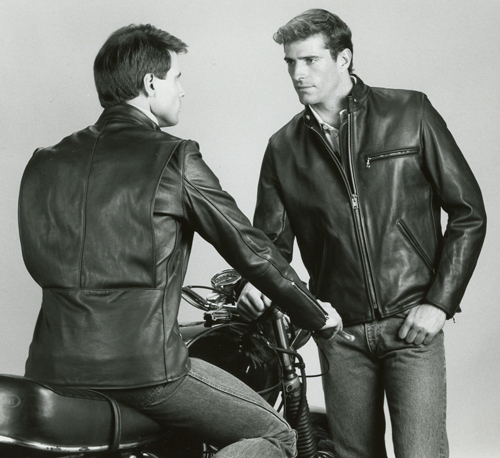 So, as you see, much thinking and personal riding experience went into the re-engineering and refinement of our jackets. Thats how you build a jacket that lasts for 40 years... or at least how we do it at Vanson. Don't worry there won't be a test - at least not for you! Bottom circumference sweep is 43 inches. AR2 - the first Vanson jacket. great movement. The Back is cut longer than the front. the jacket maybe too long - especially in the front. I've been riding with my Vanson now for about 4 months. I wanted to wait on this review until I'd actually used it for its intended purpose. 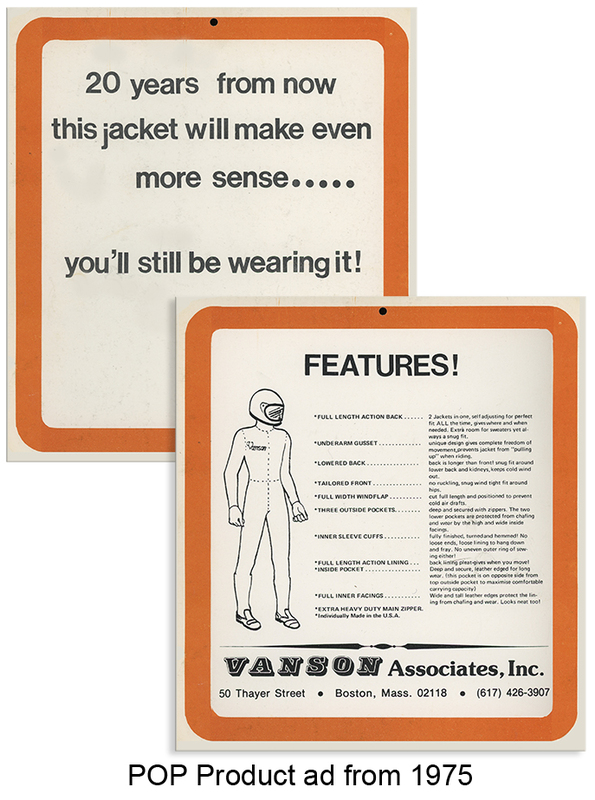 That established, I can now declare that all of the claims made by Vanson Leathers are absolutely accurate. I chose the classic AR2, and after about 3,000 miles so far this season I've enjoyed the many features mentioned in their description. It truly feels natural while riding, tailored for proper fit while on your machine. The back stays where you want it - down close to the seat. The overall fit is exact, and keeps out (or allows in as desired) any air movement. Leaving the sleeves unzipped is a helpful option on sweltering days. The jacket was a bit stiff at first - I chose the competition weight leather so I expected this - but it now moves as I do after a bit of use. I hope never to hit the pavement, but feel safe knowing that I'm well-protected. People often comment what a nice jacket this is, and some of my friends have mentioned how good I look in my AR2. Comments like this don't bother me much either. The only care I've given it is to occasionally wash off the bugs, and a light conditioning after being caught in the rain. It looks as good now as when new. I'm truly glad that I purchased this - my first "real" riding jacket - and possibly my last. I can see now the problem for Vanson that people can buy just the one jacket and wear it for life a good problem. I can begin to imagine having a second Vanson however of a different cut, for "off-road" use ;-).